A world tour was not Samuel Clemens's first choice as a way to spend his golden years, but financial misfortune had made one a necessity. His publishing house, Webster and Company, failed in 1894 and his large investments in the Paige Compositor typesetting machine evaporated when the complex apparatus was made obsolete by the Linotype. A series of lecture engagements to span the globe was seen as a way to recoup some of his losses and pay off his creditors. It was under those circumstances that Mark Twain, sixty years old and in poor health, appeared at the Marquam Grand Opera House on Friday, August 9 1895. 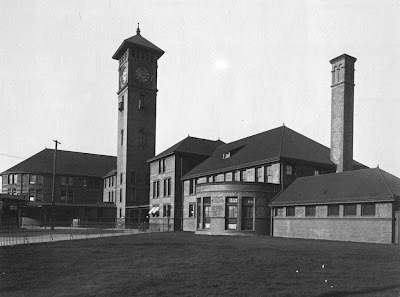 He arrived at the nearly completed Union Station from Tacoma that evening with his manager, Major James B. Pond ("Pon" to Twain). His wife, daughter and the rest of his traveling companions had elected to stay behind in Washington. The night was warm, with the smell of smoke from distant forest fires in the air. He was shuttled from the station by coach on 6th Street to the Marquam Grand, where a standing room only crowd waited. The Marquam Grand (left) where Twain appeared, and the Hotel Portland (right) where he stayed on August 9 1895. Portlanders had flocked to the city's most opulent venue to see the noted humorist, whose reputation as a speaker nearly exceeded his as an author. "With rare versatility, Mark Twain not only excels with his pen, but is equally at home on the platform, and captivates his audiences by the dry, droll, almost apathetic manner of which he brings out the wit and humor of his own productions." -The Oregonian, August 4 1895. "Mark Twain is greater today than he was 25 years ago. His fame is more permanent, and stands more prominently out, now that his fortune is gone. Reading him is good. Hearing him is 50 per cent better. It was the same way with Dickens." Mark Twain at the Marquam Grand Opera House. -The Sunday Oregonian, August 11 1895. Twain took to the stage in front of the "very fashionable and extremely large" audience. His loosely structured monologue featured excerpts from My First Theft, The Jumping Frog of Calaveras County, The Character of the Bluejay, A Fancy Dress Incident, A Bit More than He Could Chew, Tom Sawyer's Crusade, Fighting a Duel in Nevada and A Ghost Story, interspersed with digressions and improvisations. The audience was in high spirits, punctuating Twain's droll delivery with laughter. After an hour and a half, he left the stage, but was called back by the crowd for a rendition of The Stammer's Tale. "...at its close the lecturer took occasion to thank his hearers for such a cordial reception on a summer evening, and expressed his sincere gratification that his meeting with the public of Portland was of such a substantial and pleasing character." -The Oregonian, August 10 1895. 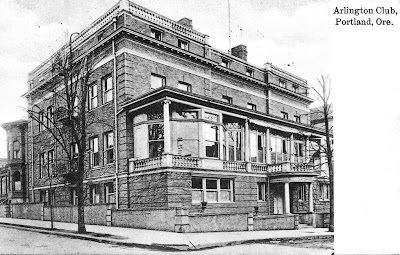 The Arlington Club at Alder and West Park, its home from 1892 to 1910. 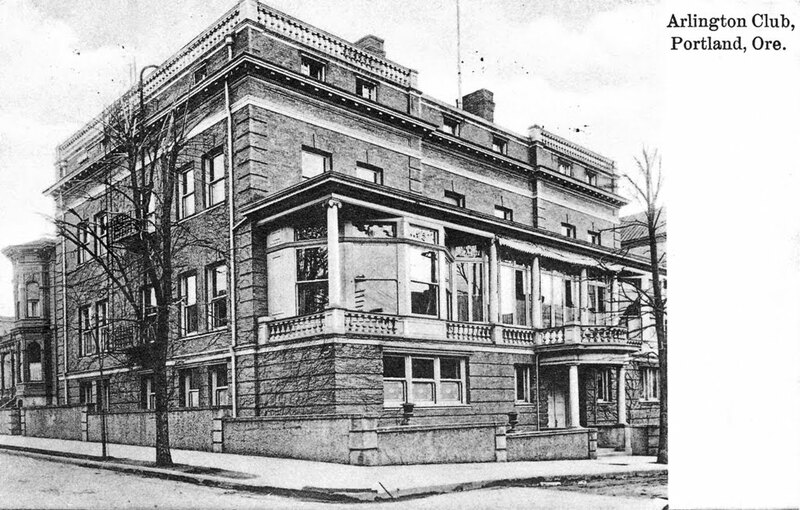 After the show, Mark Twain and his entourage proceeded two blocks west to the Arlington Club for a dinner hosted by Twain's long time friend, Charles Erskine Scott Wood, where he held court with some two dozen of Portland's Haut Ton set. He then retired to the Portland Hotel. Portland attorney and author Charles Erskine Scott Wood was a long time friend of Samuel Clemens. In 1882, while assigned to West Point as an aid-decamp to General O.O. Howard, C.E.S. 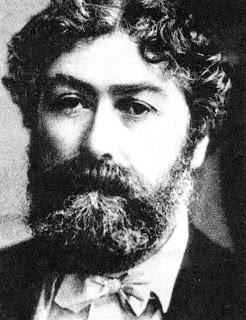 Wood helped facilitate the anonymous publication of Twain's ribald farce "1601". Twain would later write of the work" "if there is a decent word findable in it, it is because I overlooked it". L.L. 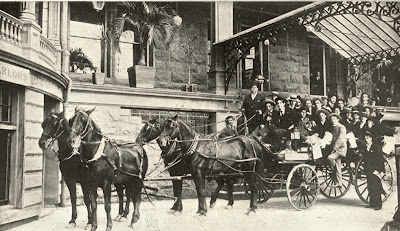 Hawkins at the reins, outside the Portland Hotel on June 18 1895, three weeks before Mark Twain departed there for Union Station. The following morning, Twain, wearing a blue nautical cap, stood outside the Portland Hotel as his bags were loaded into the coach to take him to Union Station. "Dozens of people came up to reach over the array of handbags and shake hands with Mark Twain. Most of them claimed to have met him before, and his face wore a rather puzzled look sometimes as he was reminded of the various places and occasions where he had met them in days gone by." 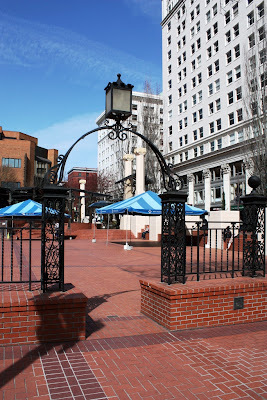 "Portland seems to be a pretty nice town and this is a pretty nice smooth street. Now Portland aught to lay itself out a little and macadamize all the streets like this. Then it aught to own all the bicycles and rent 'em out and so pay for the streets. Pretty good scheme eh? I suppose people would complain about monopoly, but then we have monopolies always with us. Now in European cities, you know, the government runs a whole lot of things, and, runs 'em pretty well. Here many folks seem to be alarmed by government monopolies, but I don't see why. Here cities give away for nothing franchises for car lines, electric plants and things like that. Their generosity is often astounding. The American people take the yoke of private monopoly with philosophical indifference, and I don't see why they should mind a little government monopoly." The conversation continued about Twain's next book of travel writing. "It will be a lazy man's book. If anyone picks it up expecting to find full data, historical, topographical, and so forth, he will be disappointed. A lazy man, you know, don't rush around with his note book as soon as he lands on a foreign shore. He simply drifts about, and if anything gets in his way of sufficient interest, it goes into his book." The newly completed Union Station, circa 1896. "There must be some reason why a town like Portland has not long since built a new depot. What is the reason?" 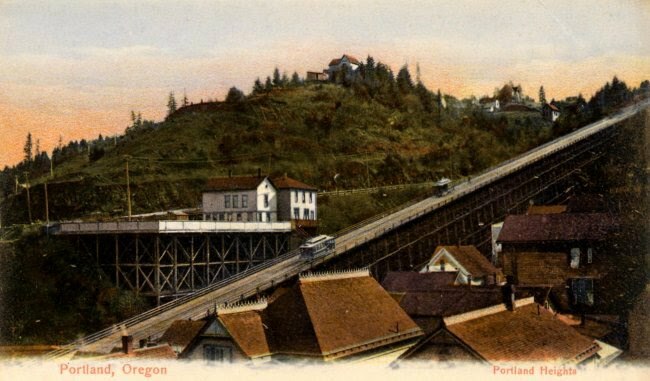 The reporter explained that tow of the railroads serving it had passed into receivership, which delayed construction (a major depot had been planned for Portland since 1883). "We mortals can't create, we can only copy. Some copies are good and some are bad." He bid farewell as the train prepared to depart. 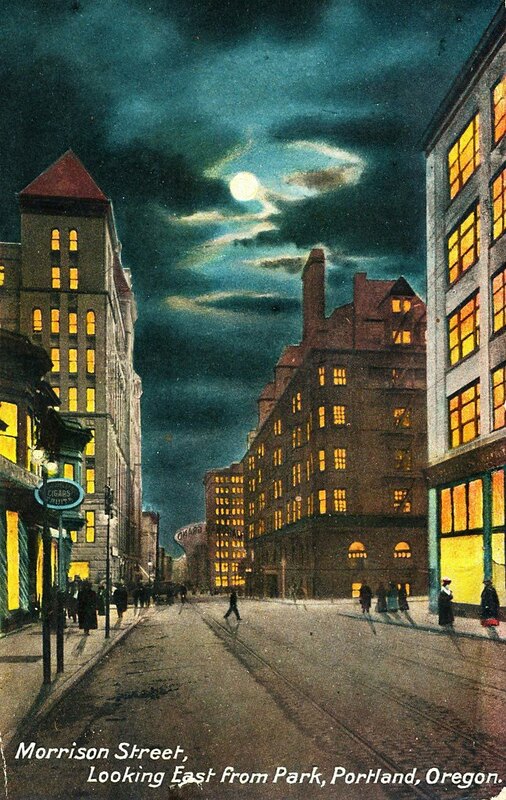 "Well, I haven't had an opportunity to see much of Portland, because, through the diabolical machinations of Major Pond over there, I am compelled to leave it after but a glimpse. I may never see Portland again, but I liked the glimpse." Mark Twain at Union Station, from the Sunday Oregonian, August 11 1895. Twain continued the Northwest leg of his tour with appearances at Olympia, Seattle, Victoria and Vancouver before departing for Australia. He would recall his sojourn in the region in his "lazy man's book" published two years later. "It was warm work, all the way, and the last fortnight of it was suffocatingly smokey, for in Oregon and British Columbia the forest fires were raging." -Following the Equator, a Journey Around the World, by Mark Twain. The world tour was a success and within three years he would be out of debt. 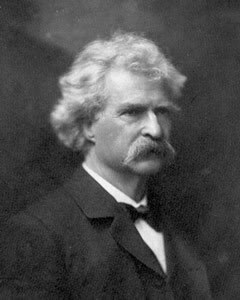 Despite his ill health on tour, Mark Twain lived for fifteen years after his Portland appearance. Those in Portland not fortunate enough to escape the smoke to Seaside or Long Beach had a variety of activities to choose from the weekend of Mark Twain's visit. At the regular Free Suffrage meeting the conversation was on the "topic class" presented by Abigail Scott Dunaway to leading society ladies who wanted to be informed on the equal suffrage question. At Fourth and Morrison, crowds flocked to the new beer hall opened by the Schlitz Brewing Company. The Oregonian wrote: "The beer was delicious and a positive revelation to those who had never been fortunate enough to taste the product of a great brewery." Perhaps in response, admission to the Gambrinus beer garden near 23rd and Washington was free. Meanwhile, south of town along the Macadam Road at the White House's race track, a bear baiting proved a disappointment to a "party of well known sportsmen" when the two year old black bear, after cuffing about the eleven dogs sent after him, made friends with the pack. At the other end of the entertainment spectrum, for those wanting to escape the dust of the city, if not the smoke from the forest fires, relief was a cable car ride away to Cable Park, atop Portland Heights, for a concert that featured selections from Verdi and Strauss. The story of the forgotten park, and the attractions to be found there, will be the subject of the next installment of Cafe Unknown. 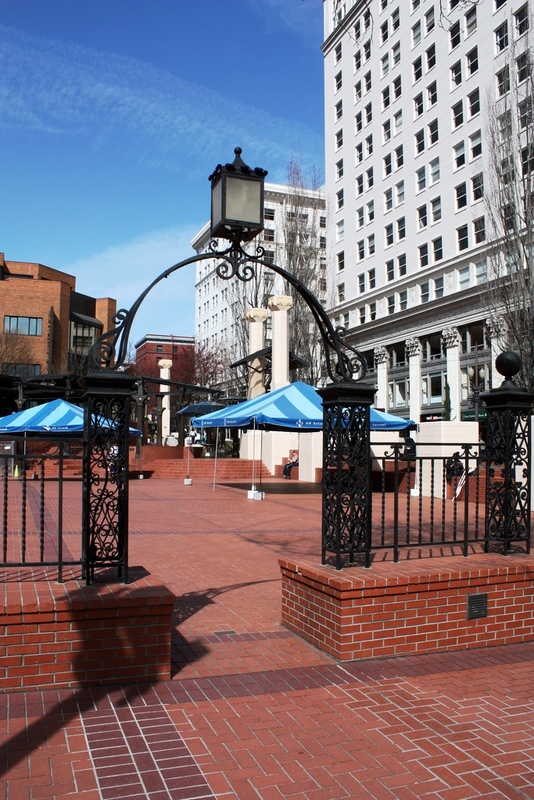 Original iron work from the fence of the Portland Hotel, restored to its original location at Pioneer Courthouse Square, a few yards from where Mark Twain departed for Union Station. One of the woman on the ship traveling with Mark Twain's included in Innocents Abroad (1869) owned an establishment on NW 23rd (Portland). I'm guessing they were not fast friends. What an interesting post, particularly Twain's comments about the Portland roads and the concept of renting out bicycles. I appreciate that you included details of the smoke from forest fires and the other events such as the bear baiting. It's hard for me to imagine Twain in Portland or anywhere in the NW. I can imagine him in the eastern and southern parts of the US, even in the Midwest and in Europe, but he seems 'out of context' in the NW. It may be my imagination, but his reaction and comments seem to suggest that he felt he was in a foreign land. This is a great vignette, isn't it! On the more narrow bike angle, for more on Twain's bike comments, see the discussion at Bikeportland. For more on L.L. Hawkins, his proposed bikeway to Mt. Hood, and the White House bike path, see here. Hawkins also squired around John Olmsted when he were visiting in 1903 for the parks plan. Christine- The smoke was my favorite detail to emerge. It appears tangentially in newspaper stories that week, I was thrilled to find Twain mentioning it himself in his book. Ved International Education is an organization run by young and energetic team to conduct IT development in Nepal. It has been working in a very smooth way since long period. The main objective of an organization is to reduce unemployment through self employment program. For this purpose it has been providing the training of eCommerce specially related towards outsourcing. "Homer Davenport, the great cartoonist, was very well acquainted with my father [Si Rich]. 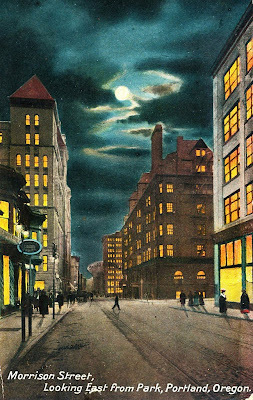 Well, one evening at the Portland Hotel stand, he went to one side where he could lay down his paper pad on a flat area, and coming out of the elevator and walking up the lobby was Mark Twain. "He was dressed in a white full dress suit with chesterfield cape, and Davenport was sketching Mark Twain, unbeknown to him, of course, and when he got through my Dad said, 'I'd like to have that sketch, I'll give you ten dollars for it,' and Davenport said, 'No, I want this one.' That was an incident that happened in the hotel, I remember that." The opening of the chapter said that Rich's Cigar Shop open after the arrival of Rich in 1896, which of course was a year after Twain's visit. However, Rich's Cigar Store is still in business, and it's banner graphic on their Website says "Since 1894." They are located at 820 SW Alder. Of course, in 1895, Davenport was working for Hearst's San Francisco Examiner, and he was soon headed for NYC after Hearst's purchase of the NY Journal. Davenport no doubt was in Oregon prior to his trip back east as one of Hearst's "inner circle" transferred to the Journal. Great entry! Thanks for the details!